Sandstorms are nothing new to the people living in the GCC. Sandstorms can trigger some people and they can cause problems like asthma, breathing problems.etc. Wearing a veil can help you cover your nose and mouth. 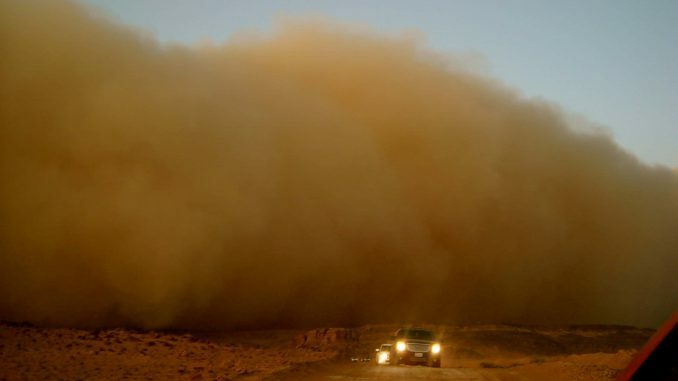 When high speed winds drift dirt and small sand particles into the air is particularly when sandstorms are caused. It can cause severe damage to the environment. Not to mention death, if care is not taken. That’s why proper steps are important, keep reading to be safe. Beat the storm? But how? While you’re driving and you sense a sand storm building up its best to arrive to your destination then and there to avoid any obstacles. However considering the circumstances it’s very difficult therefore, stop somewhere and wait for the storm to end or better yet before setting out to the road, check the weather forecast and see if a sand storm is expected or if the visibility is low better not go to work or go out that day. Where? When a sandstorm occurs it’s going to blind your path in a matter of few seconds so better hold up and wait. Trying to drive through it is brave but foolish. Take shelter at a place you seem fit perhaps a strong structure like a building or some trees if there are. Panicking shouldn’t even be one of your last options. Don’t stop in the middle of the road though as people behind might not see you and eventually collide. Just follow the white lines on the road and slow down use light beams and do not turn on the hazard lights. Focus; don’t multitask. Planning ahead is quite smart. If in case your stopped switch on to a radio on your phone and listen to the activity going outside. But it’s still advisable not to leave for your journey while you know the weather outside. Bring drinks and snacks as well as, a first aid kit and a torch to aid you in a difficult situation. If you’ve stopped utilize the time and plan ahead about what you are going to do it’s a great way to let time fly by. Besides sandstorms in this region are way too common to be taken lightly. You really don’t know what awaits you. In case you haven’t gotten the broadcast of the weather it’s advisable to bring a sandstorm first aid kit with you on board at all times. It should consist of the necessities like some masks or air tight goggles (more than one if you have people on board with you). Also if you’re traveling in the winter season bring some blankets and thick jackets or clothes in case you have to stop for the night. If kids are on board their likely to cry and tire you out, so bring some gadgets which could entertain the kids. Bring something for yourself too. A flashlight is something you just can’t forget. Fate is something that’s unpredictable, what one plans is just a probability of it happening. In addition to the weather of the GCC unpredictability is this region’s main point. That’s why staying pre cautious is the best way to live in this area. The climates can change but when you have the right things with you worrying will not stay an option and you’ll be relieved all the way. Keep a sandstorm and safety kit with you for all circumstances and some extras to entertain you know all the essentials? Then you’re ready! If you see a dust storm forming in the distance, exit the roadway immediately. If you are on the freeway, leave the freeway at an exit ramp, if possible. Wait until visibility is at least 300 feet before re-entering the roadway. Heavy rain may follow the dust storm. Stay tune with cashyourcaruae.com for more information.